Meghan Markle stepped out in Australia on Tuesday wearing items of Princess Diana’s jewellery in a touching tribute to her husband’s late mother. 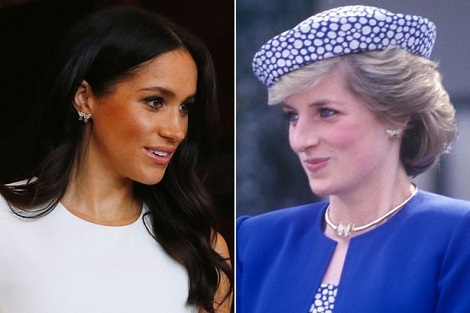 The Duchess of Sussex showed off butterfly earrings previously worn by the Princess of Wales during a trip to Canada with Prince Charles in May 1986.She was also pictured wearing one of Diana’s bracelets. Both are thought to be a gift from Prince Harry to mark their happy baby news. But it’s not the first time Meghan, 37, has adorned her mother-in-law’s jewels. Most notably, on her wedding day she was pictured travelling to the couple’s evening reception wearing a stunning aquamarine ring which once belonged to Diana. 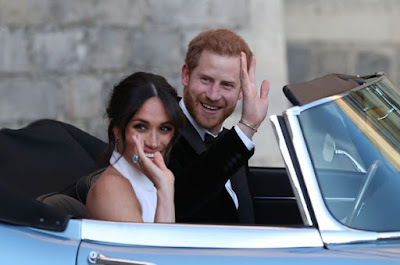 The emerald-cut stone, surrounded by small solitaire diamonds and set in 24-carat yellow gold, was striking on her right hand as the beaming bride waved to photographers from a vintage Jaguar. It’s believed the ring was a gift from her new husband, Prince Harry, but what was not known by the public at the time of the wedding was the bittersweet history behind it. Royal commentator and author Richard Kay, who knew Diana personally, claims he can reveal that the ring was actually a gift given to the princess on the day her divorce was finalised in 1996. “It was given to her by diplomat’s wife Lucia Flecha de Lima, one of her closest friends, who bought it to replace the engagement ring Diana no longer wanted to wear once her marriage ended,” he wrote in the Daily Mail. Indeed, Diana has been photographed wearing the beautiful aquamarine jewel on her wedding ring finger. The stone reportedly came from the same mine in Brazil which has provided aquamarines for the Queen. Kay believes Meghan has taken the gift with her on her royal tour, so we might well see it again in the next two weeks.